The lights are illuminated at dusk around this historic building, home to the Saskatchewan Legislative Building in the City of Regina, Saskatchewan, highlighting its stunning architecture. The architecture of the building is the "Beaux Arts" style dating back to 1908 with construction being completed in 1912. Outside the entrance to the legislative building, an equestrian statue of Queen Elizabeth II is silhouetted in the lighting. Queen Elizabeth II is posed on a Burmese type of horse and dedication took place in 2005. 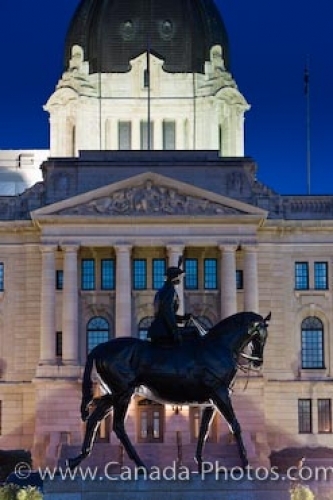 The entire statue is made of bronze and the lights off the legislative building sparkle off its beauty at dusk. Equestrian statue of Queen Elizabeth II backdropped by the Legislative Building in the city of Regina, Saskatchewan, Canada. Photo of a statue of Queen Elizabeth II at the legislative building in Regina, Saskatchewan.